Have you seen the magazine ads for the Ultima games? You should take a look. I promise it will be brief, and you’ll be surprised how RPGs were marketed before anyone knew what RPGs were. While the ad doesn’t tell us anything of the game, keep in mind the year is 1980. All it says is ‘the ultimate role-playing game’ hence ‘Ultima’. The Ultima series logo had not been created yet so we get some odd yellow writing. I’ve always loved the cover. It is a display of dark fantasy. For Ultima II, it got a two page spread. The cover is insane. A cowboy is halfway in a Moongate (the portal) with a ray gun with a dark looking winged monster is nearby along with a castle on a hill and multiple planets in view. It’s like the artist went wild. It is, ironically, a fitting image for Ultima II which is insane as the game takes place in various timelines and you use a space ship to go to different planets. Only Chrono Trigger is as wild but that is to a much lesser extent. Ultima II doesn’t even make sense. While you have to click to read the ad, it is worth it as it gives a description for Ultima II and Ultima I on the other page. It’s like they don’t know how to describe it other than ‘ultimate in fantasy’ hahaha since you travel so much through time and space. For Ultima I, they sell it by the variety of what you can do (sea, land, forests, dungeons, spaceships!). This variety had to get people to notice it back then. I recall the most surprising games having such rich variety (such as Super Mario Brothers with you going from land, underground, sky, castle, underwater, over-water, etc.). Starting with Ultima II, the games came in nice jewel boxes with cloth map, trinket, multiple manuals, the works. The game was designed to last you months. It’s like a sports car of video games at the time. 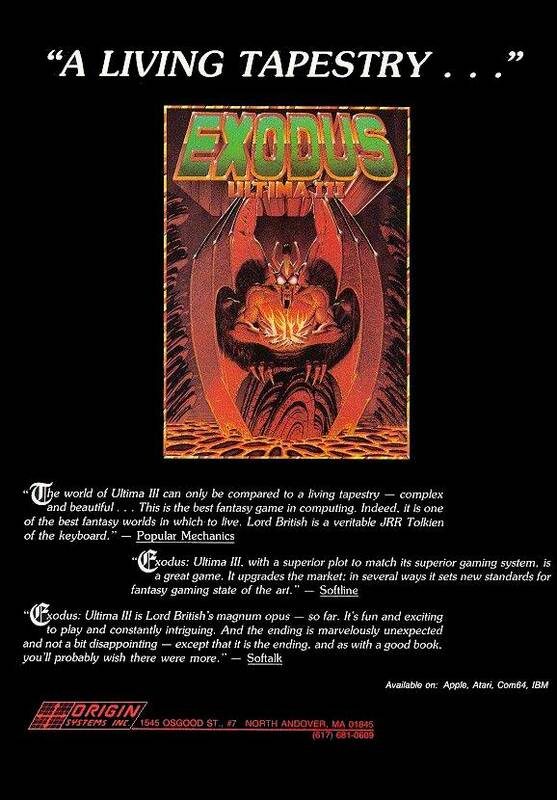 The ad for Ultima III just has quotes from the game reviews at the time. They hail Lord British as video game’s version of JRR Tolkien (which I believe is accurate as every RPG, including Zelda and hack-and-slash RPGs can be traced back to Ultima). It’s interesting how the reviewer quotes don’t know quite how to describe Ultima III except to call it the ultimate in fantasy gaming. “A living tapestry…” what does THAT mean? I really, really like the phrase ‘upgrades the market’ so much that I am going to steal it. Some readers have emailed me saying they had gone and tried to play the Ultima series and with Ultima I and II their reactions were: “WTF is this! ?” hahahahahaha. (Remember, we paid $144 [inflation adjusted] for Ultima II in 1982! haha). But they become very comfortable with Ultima III. The reason why is that Ultima III set the mold for what we call the “RPG genre”. The year for Ultima III was 1983. Notice that with Ultima IV’s ad, it talks the RPG talk we all know such as ‘magic system’ and ‘dragons’ and ‘party members’ and ‘enemy types’ and even ‘terrain’. What should leap out at the reader is the last line: ‘The ultimate challenge- the self- awaits…” That is what made Ultima IV so famous. It’s a shame modern games don’t have the balls to attempt to copy that (they’ve copied everything else so why not the virtue system?). 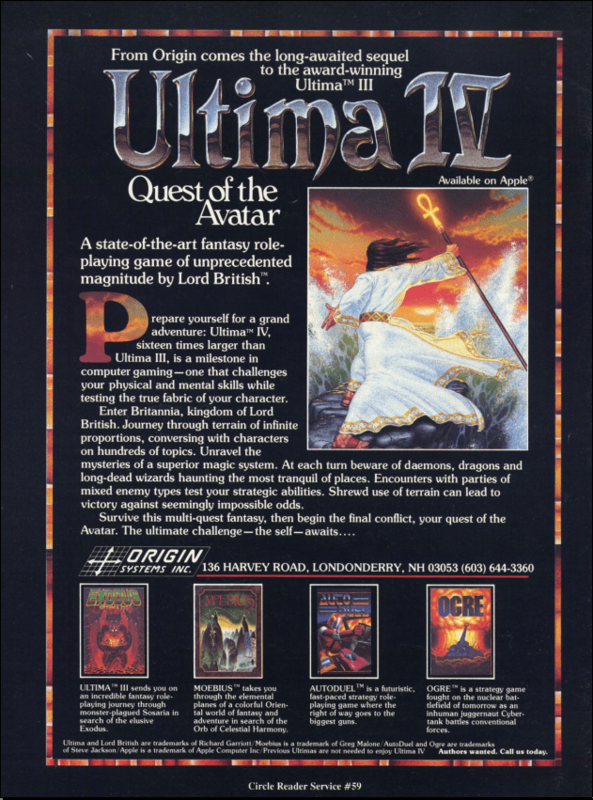 Ultima IV came out in 1985. “The wait is over…” Note how this ad, as well as the Ultima IV ad, were written as if there were many hungry fans out there eagerly awaiting the sequel. This is true. 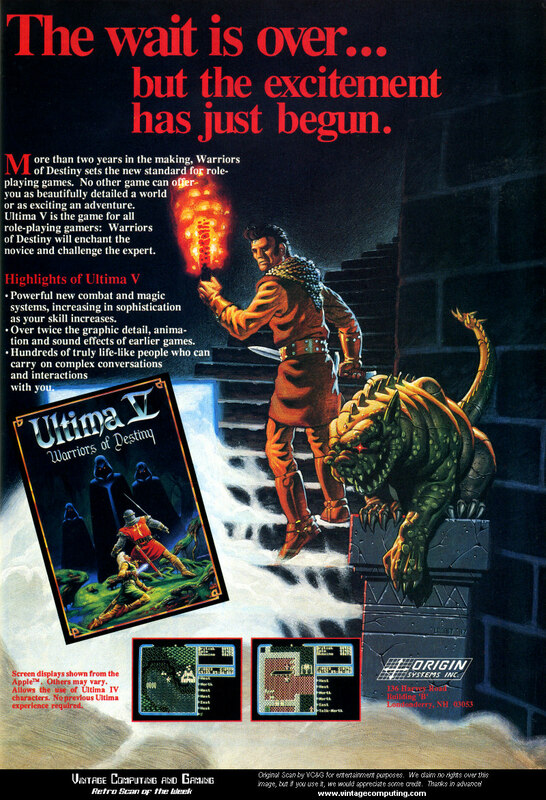 Ultima V came out in 1988, three years after Ultima IV. The ad boasting about the graphic improvements will puzzle the modern reader when you see the screenshots. “THOSE are graphic improvements?” To give you a taste of that time, my brother was so excited about reading a preview of Ultima V that he came to me and said, “Can you believe it, Malstrom? You can TALK ACROSS TABLES!” This was apparently big news then. “And when it is night, you can only see one square around you.” That was immersion in RPGs in 1988! What I found noticeable about this ad is how Ultima V is marketed like the Wii. I’m serious! Read it. It says this game is for EVERYONE, for the expert and the novice. 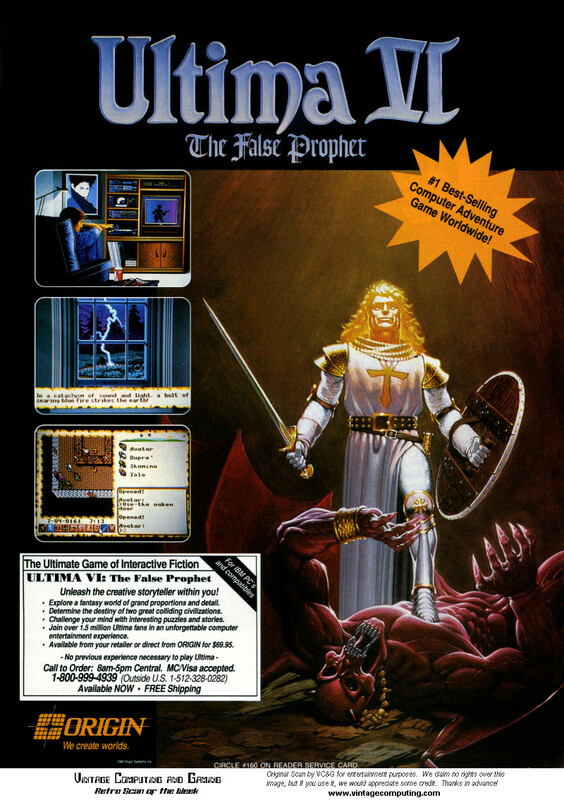 You will also notice at the bottom where it says: “Allows use of Ultima IV characters.” What does that mean? Ultima was allowing you to transfer characters over to the new game. The same exact character you used in Ultima IV would be your character in Ultima V. This was yet another cool innovation that RPG game makers haven’t caught on to yet. “No Ultima experience required…” Wii marketing in 1988! I love it! In 1990 came Ultima VI. The game engine cost a fortune to make, and it is probably the first time a game company had people develop a game engine independently and had other people responsible for the content. This allowed the game engine to be re-used (for Worlds of Ultima games). Ultima VII’s engine would be re-used for Ultima VII Part II. And Ultima VIII’s engine would be re-used for Origin’s Crusader series. At this period of time, RPGs were a hot thing before RPGs crashed (only to be revitalized later with Balder’s Gate and other games). The RPG scene was very crowded with series like Might and Magic or Wizardry. But Ultima rose above their competitors by doing something I really, really wish Nintendo would do: by creating a new game engine for each new game (hence, making spin-offs only with the old engine). 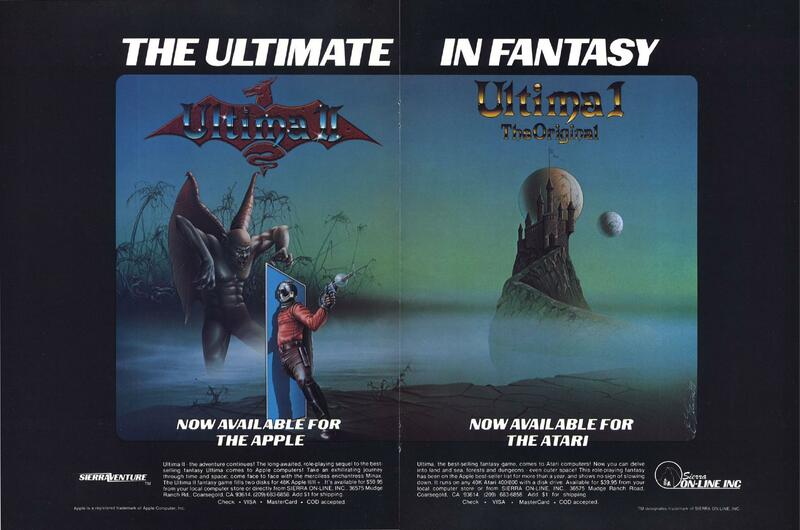 I believe the ad is trying to differentiate Ultima from the other RPGs at the time. You don’t hear any of the usual ‘RPG’ things described as you did in the previous ads. Instead, they call Ultima VI the ‘Ultimate Game In Interactive Fiction’ and say the game will unleash the ‘creative storyteller’ in you. What!? Hahaha. The RPG competitors did many RPGish things, but they weren’t creating a story or world that was always present in Ultima games. I suspect they emphasized the differentiating feature in order to market the game. Ultima VI cost $70 when it was released. Let me take a break here while the reader absorbs it. $70 for a video game… in 1990. “What is $70 inflation adjusted?” Let us find out, reader. The calculations say it is $125. That’s actually not too far off from the earlier Ultima games inflation adjusted. It goes to show how much value the games commanded from the market at the time. 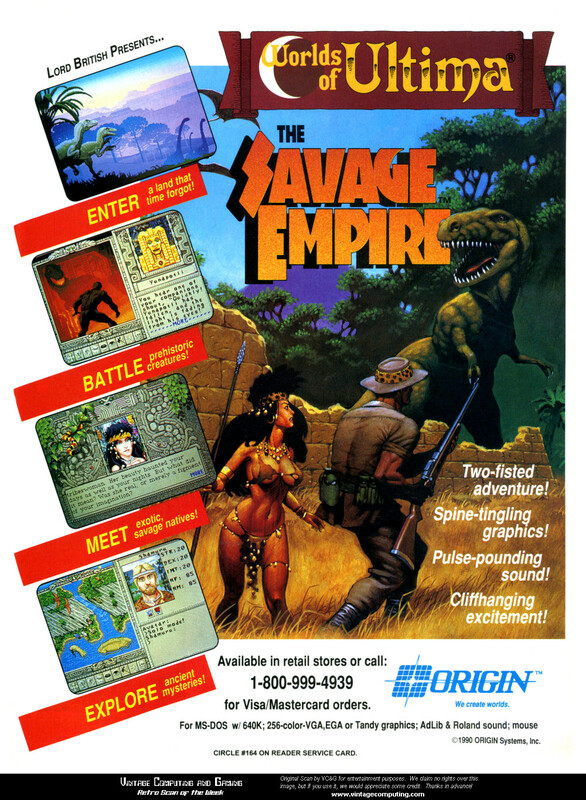 And here is the Savage Empire ad (game came out in 1990). The ad just pushes how ‘exotic’ the game is (e.g. it has dinosaurs, ancient mysteries, and nearly naked women running as companions). This game was rushed. It was a disappointment. In 1991 came Martian Dreams. The ad doesn’t market the game as a RPG. It markets it as a science fiction story. The ‘WHAT IF…’ is heavily used in science fiction genre and was how Origin marketing thought to market the game. 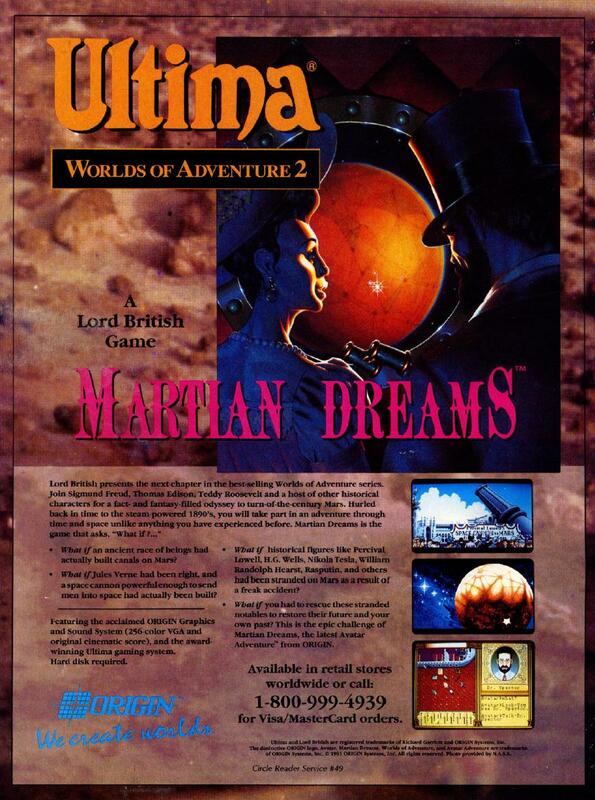 Ultima was known mostly as a RPG so it is interesting, to me, they chose the exact same marketing for Martian Dreams as publishers do for science fiction books. Origin and Looking Glass define the dungeon crawler with Ultima Underworld! And look how confused the ad is. The ad doesn’t know how to show off the game! It shows many screenshots different perspectives of, not that interesting, objects. The ad even admits that it has failed as an ad and asks the reader to just go get the demo (and if the retailer doesn’t have, tell them to call Origin where they promise to send it out right away). The ad doesn’t bother trying to market Ultima Underworld as an RPG. There were countless RPGs out at the time. It tried to market the 3d environment of Underworld. Why? It was the differentiating factor compared to many other RPGs. Wizardry certainly never looked like that! Hahahahahahahhahaha. As soon as I saw this ad, I burst out laughing. Only Origin could pull something like this off. Have you ever wondered what would happen if a video game box gave marketers the middle finger and just made the box completely black? 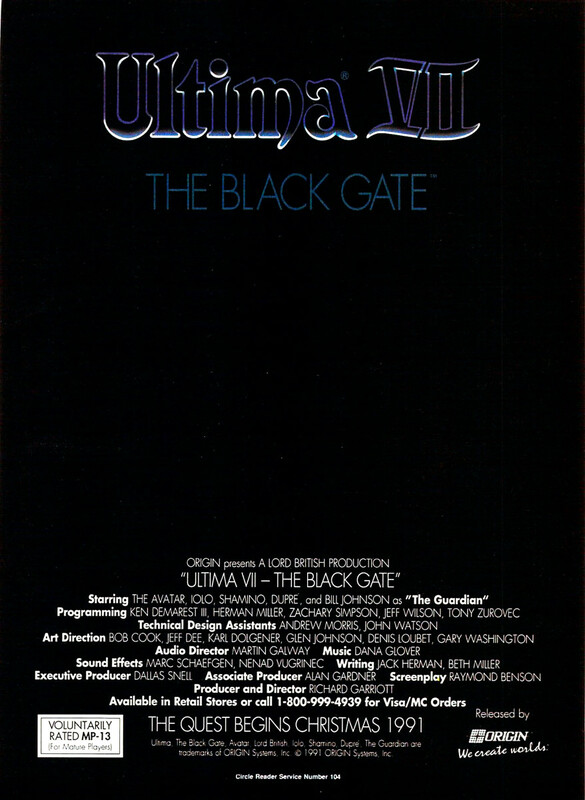 Ultima VII’s box art was completely black (aside from the title logo). The marketing department had to have had a stroke when this occurred. The back of the box was completely black too aside from a few screenshots at the bottom. It was so bizarre. But this ad… this ad replicates the same middle finger to the marketers. You have an ad for a game and left it completely black? Worse, Origin markets the game as a movie! “Starring the Avatar. Shamino, Iolo, Dupre….” What IS this? Hahahahaha. It even has a ‘voluntarily rated 13’ sign there. This was right before the game industry ultimately made the ESRB. I’m not sure what Origin was trying to accomplish with this ad. It was either a form of protest against EA, a form of protest against marketers, a stab at creating a movie poster, or just a continuation of the ‘completely black’ game cover. 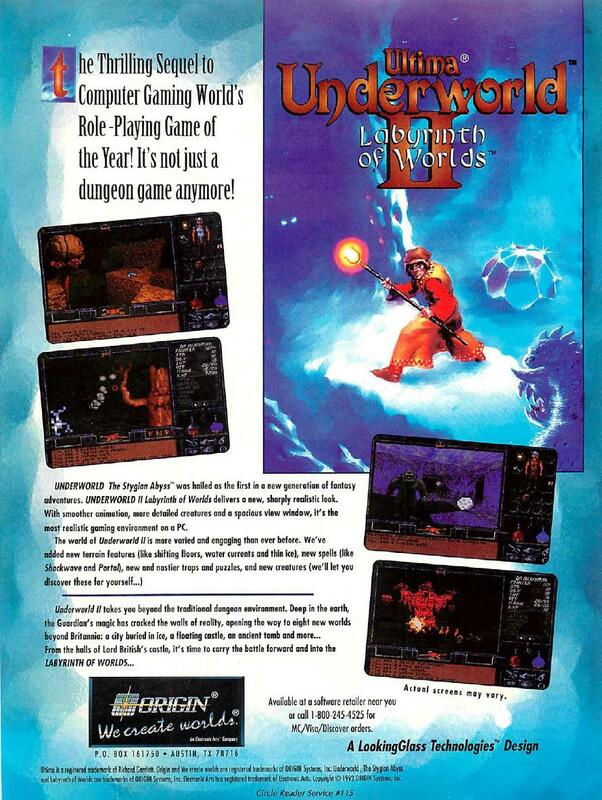 In 1992, Origin and Looking Glass marketed Ultima Underworld II as ‘outside the dungeon’ dungeon-crawler. Interesting. In 1993, Serpent Isle’s ad is very different from the Black Gate. The ad appears to be a traditional RPG ad that talks about the new improvements (‘new paper doll system!’). I’m not going to bother with the ads for Ultima VIII or Ultima IX. Thsoe were EA’s doings. VIII is very traditional ad and IX’s ad is beyond atrocious. I don’t think I’ve ever seen a worse ad than that. Ultima Online had tons of beta testers so its ad doesn’t really try to explain the concept of a MMORPG. It’s interesting how the ads struggled to market an RPG before we understood the concept of the RPG genre. Ultima Underworld and Ultima VII had the craziest ads. The prices of the games, when they were current, really surprised me. I forgot we paid that much back then!